Al Gore harshly criticized President Bush's push for war against Iraq, saying it has hurt the United States' standing and could dangerously undermine the rule of law around the world. "After Sept. 11, we had enormous sympathy, goodwill and support around the world," Gore said. "We've squandered that, and in one year we've replaced that with fear, anxiety and uncertainty, not at what the terrorists are going to do but at what we are going to do." In his first major speech on the Iraq situation, the once and possibly future Democratic presidential candidate accused Mr. Bush of abandoning the goal of a world where nations follow laws. "That concept would be displaced by the notion that there is no law but the discretion of the president of the United States," an idea Gore said would encourage instability around the globe. "If other nations assert the same right, then the rule of law will quickly be replaced by the reign of fear," and any nation that percieves itself threatened would feel justified in starting wars, he said. 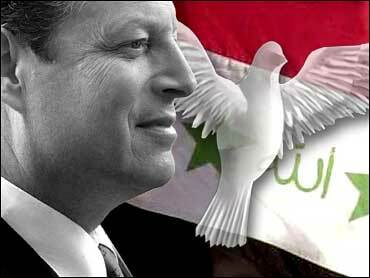 Gore said the Bush administration policy could alienate allies and derail the war on terror. "If you are going after Jesse James, you ought to organize the posse first," Gore said in a speech to an enthusiastic crowd to the Commonwealth Club of California. He added, "We should focus first and foremost on our top priority: winning the war against terrorism." Republicans quickly pounced on the speech as evidence of Gore's weakness. "It seemed to be a speech more appropriate for a political hack than a presidential candidate by someone who clearly fails to recognize leadership," said Jim Dyke, a Republican National Committee spokesman. Gore always has supported overthrowing Iraqi President Saddam Hussein and was one of the few Senate Democrats who voted in favor of the Gulf War resolution after Iraq attacked Kuwait. He said he felt betrayed by the first President Bush's "hasty withdrawal from the battlefield." "If we end the war in Iraq the way we ended the war in Afghanistan, we could easily be worse off than we are today," Gore said. Even before securing United Nations support for a multinational war against Iraq, Mr. Bush asked Congress to approve the use of "all means that he determines to be appropriate, including force," in a unilateral effort to topple Saddam. "It needs to be narrowed," said Gore, adding that Congress should urge Bush to go back to the U.N. Security Council and secure the "broadest possible international support" for a regime change in Iraq. He also said he would decide in December whether to challenge Mr. Bush again for the presidency in 2004. Former President Jimmy Carter also criticized Mr. Bush's stance on Iraq today, saying it would be a grave mistake to attack Iraq without support from the United Nations.